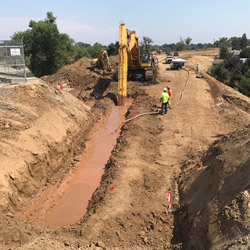 The Sutter Butte Flood Control Agency (SBFCA) is a joint powers agency formed in 2007 by the Counties of Butte and Sutter, the Cities of Biggs, Gridley, Live Oak and Yuba City, and Levee Districts 1 and 9. The agency has the authority to finance and construct regional levee improvements. It is governed by a 13-member Board comprised of elected officials from the cities, counties and levee districts. The Agency’s Boundaries encompass 34,200 properties in Butte and Sutter Counties. Learn more about SBFCA’s efforts to reduce flood risk to more than 34,000 properties in the Sutter Basin. View information on board meeting dates and locations, agendas, minutes, and videos. In June 2010, property owners approved an assessment for levee repairs. In accordance with state law, all properties that benefit from the project must be assessed. Questions or comments? We want to hear from you. Contact us today.